Artwork Design - a Career - Brighton technical school, Victoria, Australia. ​Joan Staindl studied Art at Brighton Technical School, Berwick Street, Brighton, and later joined the staff at “Semco” Cheltenham Road, Black Rock, Victoria, as an Artwork Designer. 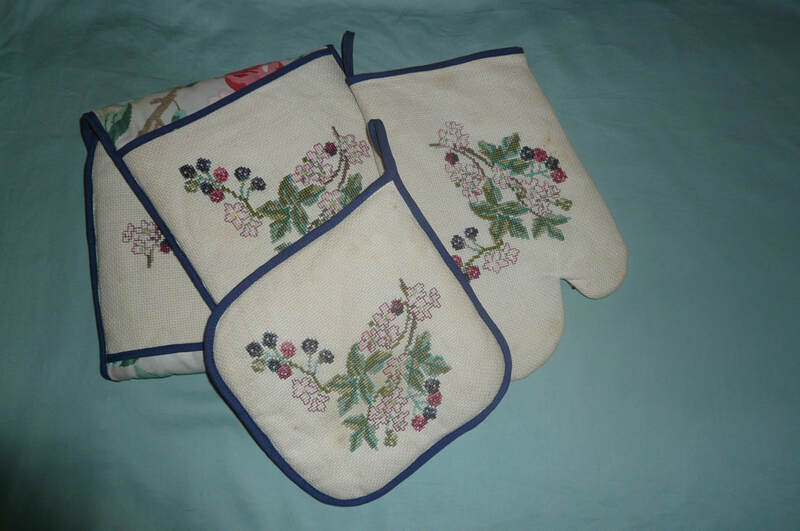 Joan designed the blackberry motifs on the pot holder and oven mits pictured below. After Joan’s design work and colour recommendations were completed her work was sent to the embroidery Staff at Semco, who transferred the design onto Aida cloth. The embroidery staff then sewed the design with the appropriate coloured threads to create a feature for the pot-holders and oven mits. The Sewing Room Staff then used the Aida cloth pieces as a feature in the finished products. On completion of the items they were used by Semco’s Sales Staff as examples of the company’s products, which were produced as sewing kits. AIDA CLOTH (sometimes called Java canvas), is an open, even-weave fabric traditionally used for cross-stitch embroidery. This cotton fabric has a natural mesh that facilitates cross-stitching and enough natural stiffness that the crafter does not need to use an embroidery hoop.